I discovered Higher Standards Leather Care online a while ago, after reading rave reviews on the Chronicle of the Horse forums. I bought myself some of the soap, but as I wasn’t riding much, never really got a chance to use it. However, now that I’m over here, and with so much gear to clean, I figured it was a good opportunity to buy some more and really test it out. First item – and I’m almost ashamed to post this because of how bad the “before” picture is – my riding boots. They were used as my work boots for the first week or so that I was here, so they had to endure mucking stalls, riding multiple horses, and trudging through mud and snow all day. As you can see, they were in pretty bad shape. An amazing before-and-after shot… I’ll never let my poor boots get into such bad condition again!! I started with the Sweet Cinnamint saddle soap, and even the caked on sweat and dirt came off relatively easily. The soap smells delicious, and really cuts through all the grime more effectively than most leather cleaners I’ve tried before. The really brilliant part though is the leather balm. These boots are the waxed, waterproof Ariat Bromonts, so they never really had a great shine to begin with, even when I used boot polish on them. The leather balm has totally erased the scuffed toes and spur strap rubs, and has brought out a beautiful shine to the boots. Next challenge was a pretty grimy old Devoucoux work bridle. The bridles here get used on at least a few horses a day, and while they do get wiped down with saddle soap each afternoon before they’re put away, they’re never really super clean. Again, the soap cut right through all the dirt and sweat, and the balm softened and conditioned the leather beautifully. Here is a great comparison with an almost identical bridle that had been cleaned with Leather New on the left, and the Higher Standards bridle on the right. And the after shot. The difference between the two bridles is pretty incredible! I also cleaned and conditioned my saddle, but unfortunately I seem to have deleted the before photo off my phone. The soap and balm worked wonders on it though, and really brought the richness of the leather colour back out – it had looked a fairly dry orange colour previously. So in conclusion – I’m totally converted. This stuff is the whole package – homemade, with natural ingredients, and seriously effective. The scents of the soaps are gorgeous too – I have the Lavender Vanilla at home, and the holiday edition Cinnamint is just so delicious. The balm even makes your hands feel amazing when you’re using it! No more greasy, grotty hands to deal with after cleaning tack. This stuff is absolutely worth trying out… I doubt I’ll ever go back to regular store-bought leather products again! It’s very easy to purchase through their Etsy store, and the prices to ship to Australia are very reasonable. Ok so the title might be a little melodramatic, but I am pretty disappointed. One of the things I’d been most excited about ever since deciding to come to the US was the opportunity to take advantage of the online shopping, without the ridiculous international shipping rates ($75 shipping for a $25 polo? I don’t think so!!). I was most looking forward to being able to shop through SmartPak, who don’t ship to Australia at all. I put in my first order earlier this week, excited to take advantage of True Prospect’s Barn Saver Shipping… Honestly, this is like all my shopaholic dreams come true. However, my order was declined because they won’t accept international credit cards 😦 I explained my situation to them and the answer was still no. So unfortunately I’ll be having to take my business elsewhere. I’m not sure they realised exactly how much money I’d saved to be able to spend with them… I have a pretty long list of wants and needs!! The top of the list is a couple of good pairs of winter boots… Since the snow has melted a bit and frozen again, I’ve done a few extravagant Bambi-on-ice impressions today. I have to give credit to my trusty Ariat Bromonts, they’ve kept my feet entirely dry and surprisingly warm while spending hours up to my ankles in snow over the last few days. 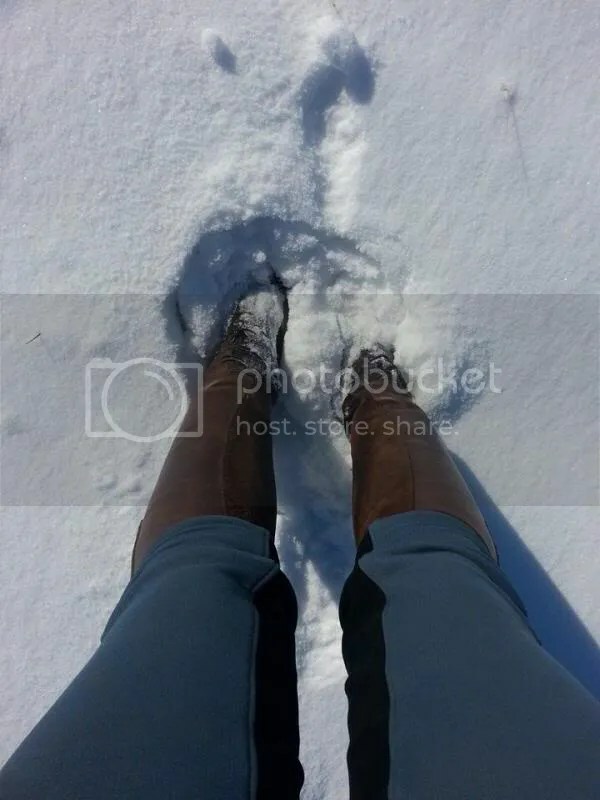 However, as riding boots they’re just not cut out for the slipperiness of the ice, so I need some more specific work boots that are more suitable for snowy conditions. Hopefully I can make it to a tack store one afternoon this week if we manage to finish work early enough. Otherwise, it’s back to online shopping… Just anywhere but Smartpak! It’s pretty funny though, and I do give people a good laugh when I say weird Australian words. I think I might have to become one of those annoying people who develops an American accent after a short visit, just so people can understand me. I’ve had a really quiet day for my first day off. I stayed in bed most of the morning reading Dover saddlery catalogues.. I am sooo excited to go on a shopping trip! Then I spent about 4 hours cleaning the bathroom and kitchen in our living area… While the barn is really organised and spotless, the living area seems a bit neglected, so my obsessive compulsive tendencies kicked in a bit. If I’m going to be here for 3 months, I want to use real appliances and cookware.. And not live on microwave pizza served on paper plates with disposable forks!